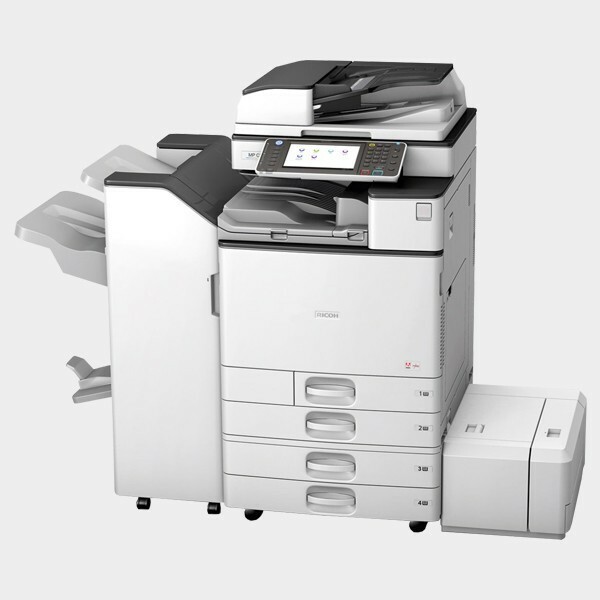 Transform your enterprise’s office productivity with Ricoh’s MP C3003SP/MP C3503SP colour multi- function printers. Improve workflow efficiency through fast, high-quality printing and comprehensive paper handling features. Print image-rich documents in large numbers like a professional by making full use of their sophisticated colour management, terrific colour matching, and top-quality output. Superb text and image reproduction make these devices ideal for everyday document needs as well as for more complex print jobs. The evenness of toner density and the vibrancy and stability of colours – even when you print/copy images continuously – will enable you to produce stunning output. Print on SRA3 paper to display crop marks for proofing: a great added-value feature. Use feedstock up to 300 g/m² (simplex) or 256 g/m² (duplex). Save time by printing envelopes directly from the standard second paper tray instead of needing an optional envelope feeder. These MFPs print at speeds up to 35 ppm. Warm-up time is a mere 19 seconds, and first copy times are 4.6 seconds (B/W) and 7.3 seconds (full colour). The devices take only 5.6 seconds to recover from sleep mode, ensuring they are ready to print when you want them to. A large variety of finishing options is available. The internal finisher saves space and is able to punch and staple. Add one of the two finishers for a professional touch. Opt for the 1,000-sheet booklet or staple finisher. Punch kits are also available and posters can be printed easily with the Poster Printing function. Cut the time you need to look for documents by searching for specific words with the Searchable PDF function. Improve your productivity by sending Searchable PDF files to email, folders and external media (SD/USB). Copy the front and back sides of an ID card onto one sheet by using ID Card Copy. This saves considerable paper and time.